Kyoji Horiguchi vs Tenshin Nasukawa was an exciting affair. The bout between the (at the very least) number 2 MMA fighter and the (again, at the very least) number 2 kickboxer in the world saw Tenshin looking for groin kicks at every opportunity and Kyoji Horiguchi looking quite convincing as far as kickboxing goes. It was also held in a boxing ring so tall that it was practically a cage onto itself, and so wide that they may as well have been competing in a field. So this raises the question, how would this fight have gone down in a ring actually MEANT for men of their size? 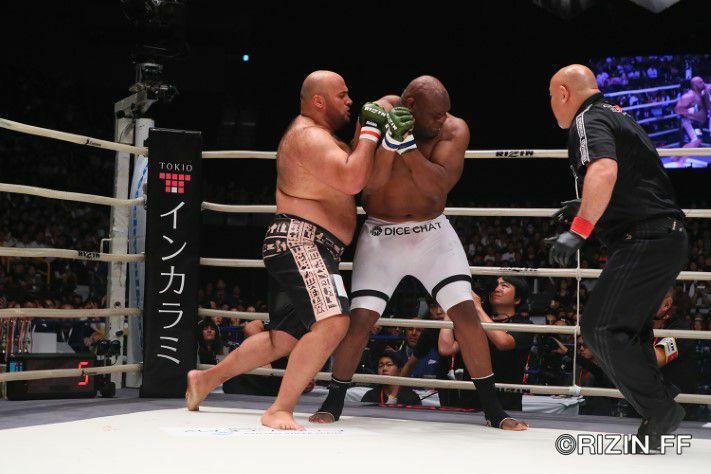 Here is Bob Sapp, in a rare winning effort fighting at Rizin 13 in that very same ring. Considering Bob Sapp’s famously ludicrous size of 6’5 and 300+ pounds, it should come as very little surprise that the five rope high ring was tall enough that our Japanese superstars may as well have been fighting in a cage. Despite being the most popular arena to fight, little is often made of ring size. We often hear fans talking about the weight of fighters gloves, and how that can impact a fight but we rarely here fans complaining about a ring being too big or too small. This is puzzling, as the type of arena greatly affects the outcome of a fight. The larger and more open an arena, the more it will favour the out-fighter. Fighters like Raymond Daniels, Floyd Mayweather and Anderson Silva would be at their best fighting in an open field, with no ropes or cage to run onto while retreating. Cages are the most forgiving arena for an outside fighter, with corners being very obtuse and easy to escape. Four sided rings on the other hand, force creativity in footwork for an outside fighter to prevent them from being trapped against the ropes – and as you would expect – a small four sided ring will benefit an aggressive pressure fighter. In order to properly assess how the ring affected this fight, we need to look at the specific strategies that Tenshin and Kyoji came in with especially. For Tenshin Nasukawa the gameplan was simple, just be himself. The kickboxing savant has proved terrifying, he has quick and powerful kicks, fast hands and all around stellar kickboxing technique that has led him to victories against IBF Boxing World champion Amnat Ruenroeng and Lumpinee Champion Wanchalong, both while under 20 years of age, no less. Kyoji Horiguchi as the underdog with no professional kickboxing experience, needed a specific game plan. He needed to close distance and pressure. Pressure is always the way to defeat a counter puncher. Give a great counter fighter too much to think about, it’s easier to hit them with something they didn’t see coming. Either by overloading them with feints, or turning the fight into a scrappy affair, it’s best to get a counter puncher off of their game. Horiguchi is ordinarily a fighter who likes distance, and the great distance provided by the comically oversized ring certainly seemed to work on his favour on the defence. Not only that but he was far more effective at getting across the gap than his opponent. Kyoji was able to get in, attack and get out, without risking too many exchanges. In this regard the great open space worked, however this also meant that Kyoji was not able to get Tenshin against the ropes, a situation which would have certainly benefited him against the young kickboxer, who has been known to have difficulty defending himself off them. Part Three: So what’s the fuss? In the fight we saw Tenshin typically get the better of a kickboxing exchange when one occurred, but Kyoji’s blitzes, and the tendency to keep his glove in Tenshin’s face to prevent Tenshin from throwing back his dangerous counter left made for some interesting moments. There were great moments of back and forth action, yet it was hard not to think that the size of the ring meant that these two fairly small men had to cross a massive gulf to get to each other at any given time. When we see large heavyweights in a ring like this, it events out, the ring is about right for their size. A smaller ring would have likely kept these the dynamic of this fight, but sped up the pace. Kyoji Horiguchi would have still been able to work from a distance without running onto the ropes, and Tenshin would have been able to close the gap a little easier. Unfortunately the massive ring and a fair few groin shots left this fight feeling almost unfinished. It was an entertaining affair with some moments of brilliance, yet I was left wondering if I had truly seen what these two could do when matched up against each other.